Gentrification is a shift in an urban community toward wealthier residents and/or businesses and increasing property values. Gentrification is typically the result of investment in a community by local government, community activists, or business groups, and can often spur economic development, attract business, lower crime rates, and have other benefits to a community. The process of Gentrification could be of up most significance if studied wisely and in a regional inter-dependent context. There are a number of urban villages in the national capital of India which by community interests and participation could be made economically viable spaces on one hand and could also raise the quality of life standards of the inhabitants of urban villages. 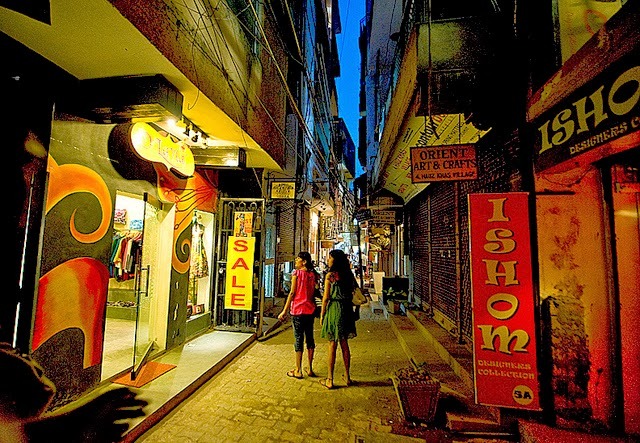 Hauz Khas is a tiny suburb of New Delhi often compared to New York City’s Soho or Greenwich Village. The gentrification of this 12th-century village began in 1980 when a famous Indian clothing designer opened her showroom here. Later all followed, and today the area covers chic restaurants and sophisticated boutiques. Today, Hauz Khas Village is almost a wishing room of urban fantasies, a place where the chic bohemian can live out a Soho-esque adventure with ease. Quaint, meandering gullies lead to tiny art galleries, restaurants where the owner might step out from the kitchen to have a beer with you, designers' studios, enchanting little shops; there is undeniably a particular energy here, a vortex of creativity you can't help but be drawn into. It is this interplay between history, culture, creativity and modernity that Hauz Khas seems to thrive on. Ayesha Sood, a filmmaker quoted this 'initially, the concept of Hauz Khas Village seemed like a fairy tale, because it was firmly against the gated-colony syndrome'. While the community has tried to retain its cultural character, the generational bullfight cannot be overlooked. The cultural disparities in these villages are much more manifest today. While the older generation is bound to its own ways, the youngsters are hopelessly pampered and the generation sandwiched between the two has emerged as a new business middle class. Urban Villages has experienced a horrendous growth in terms of planned development of the city with being the location of prime interest of the migrants for their living due to low rentals and affordable market. Migration can’t be stopped but it can be directed and so as in this case by showing it a guiding lamp of certain initiatives and policies. Mixed use on certain village streets has been provisioned in MPD-21 in order to create local marketplaces and boost up the economic status of the communities. These kind of steps and policies reverse back when they aren’t looked at regular intervals. The concept of Gentrification should be raised at diverse platforms and its awareness among the communities should be spread to not let these so called urban villages lag way behind from the overall human development of the city. However, in this process of Gentrification - the plan should be formulated according to the various factors in integration and predictions have to be made far more visionary. The process has some merits and demerits as well. There can’t be any prototype design for it – it has rather to be studied and carefully looked in depending on factors like its history, the culture it has nourished, the emerging needs, the social structure, economic viability, etc,.. Any misguided step in the process may lead to haphazard development of the area and hence the complexity of the gentrification process and the structural behavior of the urban ecosystem should be well understood before any such attempts of gentrifying an area/region/village/space are made. The process of Gentrification might upgrade or degrade the affected lives. Therefore it's very crucial to be visionary and studying the aspects of human settlement could play a big role in the entire process.